in an effort to persuade you to leave it alone. 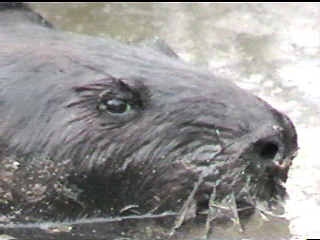 Some guide books say that the beaver splashes to warn away other beavers. In my experience that happens a few times. 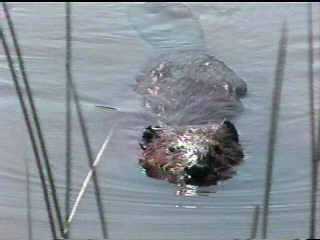 Usually the beaver is primarily trying to scare you -- and often succeeds. 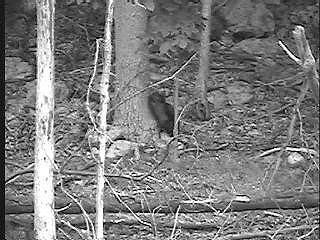 Click on the photo above to see a video giving a better idea of how a beaver uses its tail. 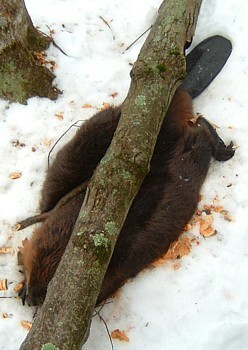 But as amazing as the tail is, that's certainly not the beaver's main muscle. 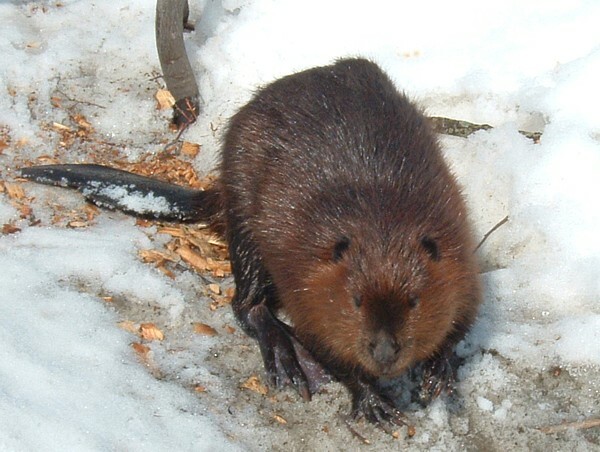 Despite appearances a beaver is more teeth than tail. 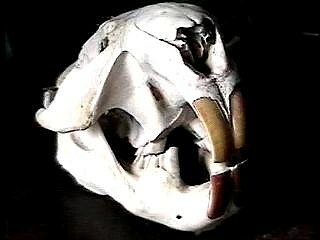 The soul of a beaver is the jaw that manages those four large front teeth which can quite manage the world. When noting their size, please don't neglect to note their shape. That is a vegetarian you are looking at, not a carnivore that will tear your flesh. Although one time my 15 year old son had some concerns as a beaver approached us as we stood by a hole in the ice of the beaver pond. 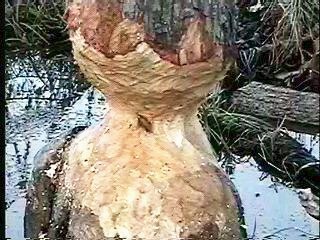 However, when a tree is a bit larger in diameter, beavers prefer to cut the trunk to a point and then let the wind blow the tree down. 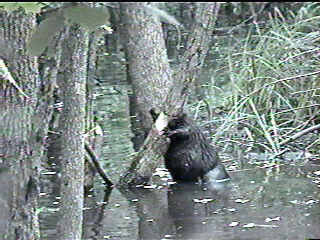 I can share two video clips I took of beavers cutting trees and then moving away when they sense the tree might fall. 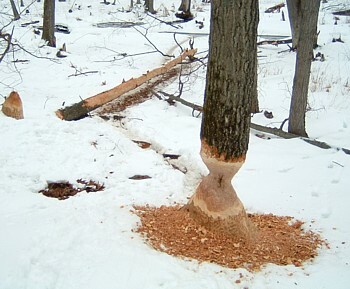 In the first the beaver comes back when it realizes that the tree is hung up in other trees and won't fall. I had to edit out a good bit of that video. 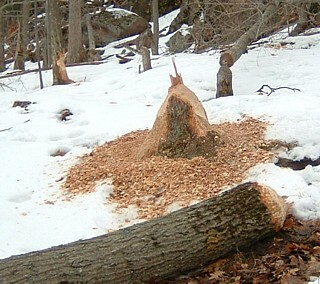 It took the beaver about ten minutes to make that cut. 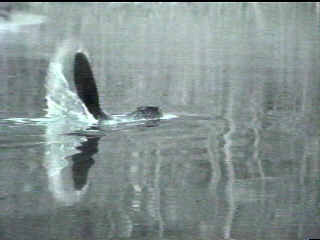 In the next video, six minutes long even with a few minutes edited out, the beaver senses the tree wobbling and trots down its trail by to the canal leading back to the pond. 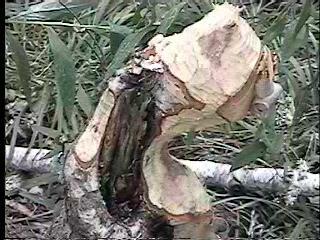 The wind blew the tree down about ten minutes later and the beaver went back to trim it. 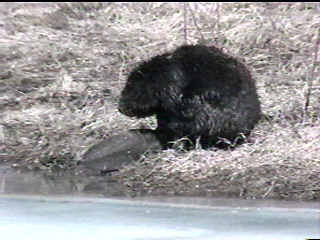 Here is the video clip of the beaver returning to the tree. I should add that beavers generally don't work in the middle of the day. But this was in the late fall and the beavers were eager to collect branches to sink in front of their lodge for their winter food. 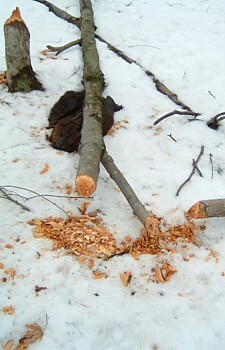 Nor did it stop the beavers from coming back to cut more off the tree that killed the beaver. 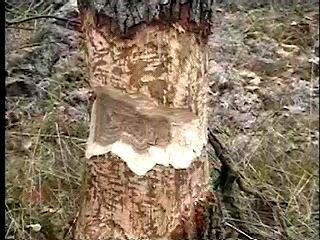 Needless to say, with all the activity utilizing trees, a good sign of beavers being around is many trees cut a foot or two off the ground in the beavers' unmistakable fashion. 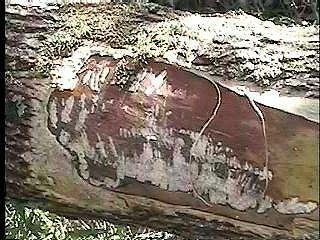 The only part of the tree they eat for nutrition is the inner layer of the bark, called the cambium layer. 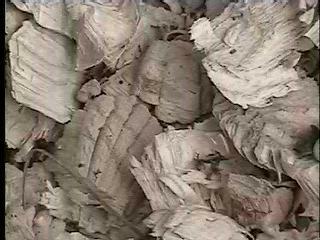 The large chips of wood they cut from the trees are left behind. They gnaw most kinds of trees, softwoods, hardwoods, even hickories, and evergreens including pines and cedar. While preferring trees less than six inches in diameter they are capable of trying to fell trees three feet in diameter. However, I don't think the beaver above really expects to fell that tree. 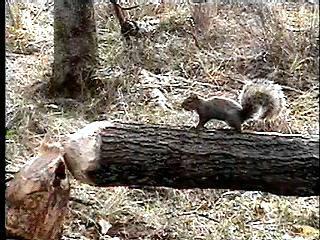 He's just enjoying all the cambium layer of the huge red oak that he can manage to reach. A key to understanding beavers is noticing how they combine two modest comforts: being close to water and enjoying cambium morsels. 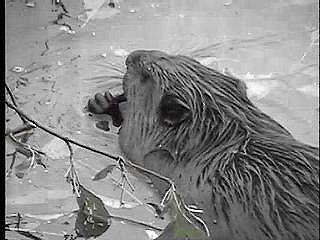 I put the video of that beaver nibbling on Google Video. To better enjoy those simple pleasures, beavers can create a rather complex environment to make it easier for them to get access to trees and to move the parts of the trees into places more convenient for their enjoyment.